OSWEGO, NY – Ron Throop of Oswego won the Best of Show award at this yearâ€™s Lakeside Statewide Juried Art Exhibition sponsored by the Art Association of Oswego. His folding multi-panel expressionistic painting entitled William Tecumseh Shermanâ€™s Army Field Manual was colorful, ambitious and full of political humor. 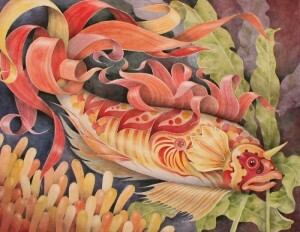 Louise Woodard of Mattydale won first prize for "Aquatic Myth." The Lakeside exhibition provides an annual showcase for new and exciting work by artists from across New York State. It provides a display of diverse subjects and artistic styles for area residents to enjoy. This exhibition is made possible in part by a generous grant from Constellation Energy. The opening reception for this year’s Lakeside show, the 13th annual, was held the evening of April 3 at the Oswego Civic Arts Center. The juror and awards judge for this yearâ€™s exhibition was Franz Weldgen of Rochester, a professor of Visual Art at Monroe Community College. Weldgen was â€œhighly impressed by the diverse array of artâ€ entered for consideration, and his job of narrowing down over 100 entries to the 50 that were included in the show was difficult. Other award winners this year were: Louise Woodard of Mattydale, who won first prize for her exquisite watercolor Aquatic Myth; second prize went to Kate Zacharewski of Syracuse for her intriguing color photograph entitled Into the Night and third prize to John Crouse of Wolcott for his playful wooden Crazy Bamboo Bowl. Honorable mentions were given to Frederick Bartolovic of Sterling for his ceramic assemblage History of Recovery; to Bob Ievers of Horseheads for his painting Southwest Steuben County; to Jason Cheney of Liverpool for his mixed media drawing entitled Cognition; to Sandy Clift of Fulton for her mixed media work Taking a Stroll in Indraâ€™s Net; and to Nancy Amerault of Jordan for her photograph Snow Desert. The Lakeside exhibit will be on display until April 25. The Oswego Civic Arts Center is located at the northernmost end of East Fourth Street in Oswego, directly across from Fort Ontario. For further information, please call 315 343-5675.